Feb 23rd. Damien Barber and Mike Wilson. Damien Barber and Mike Wilson. It is lovely to see them back in spite of their very busy schedules and other commitments. This is a duo that goes from strength to strength and they are a pair of tried and trusted singers with a pedigree to die for. They sing songs from both the North and south east traditions, as well as the best of contemporary writers and their repertoire is rooted in the songs and labours of the common man. 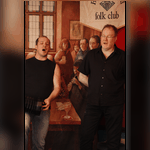 Two strong voices ably accompanied by Damien on concertina and guitar. Come early for a seat and be prepared to sing.